This new expansion pack is the most versatile yet. Many of you have asked for a PDF of all 52 Locations so that you can print them out and truly customize their path. Well, we loved the idea and so set David and Sarah to task! 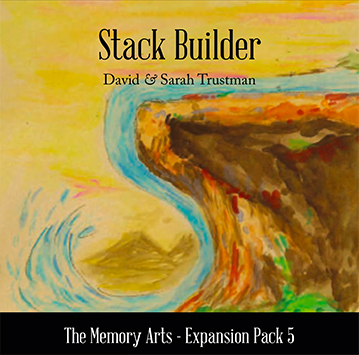 This Stack Builder Expansion Pack is an incredibly powerful tool especially if you pair it with the other expansion packs. The options are truly endless, and most importantly, they are based on YOU. What do you want to get out of your memory path? Perhaps you want to physically build your favorite single stack on a 52-location path. Now you can! Or let’s say you prefer to memorize two stacks on a 52-Location Path, but you would prefer to use the original Card Characters for one stack and the new Triple Stack Expansion Characters for the other. Well, now you can! Or did you want to add expansion Totems to your path, but you didn’t want to glue them directly into your book? Problem solved! Note: You will need to own The Memory Arts in order to take advantage of this Expansion Pack. I was one of the people that requested this and, to their credit, the Trustmans and VI came through. I had scanned the 52 places from the book and created something similar, but I sure wouldn't do it to save 5 bucks. If you use the 52 place method (and I suggest it), I think this is a must. This is great for all mem deck fans. Create your own "stories" using all 52 locations. Especially useful when used with Expansion Pack 3 Poker Hands.